Premier League clubs trying to escape relegation are likely to benefit from changing managers, a study has found. The research examined 60 managerial changes among the 36 clubs in the Premier League between 2003 and 2013. It showed that those making mid-season changes increased their points to an average 1.17 per game, compared to 1.03 at the time of departure. The benefit of changing managers, however, was greater for relegation battlers than Champions League chasers. Sunderland averaged 1.22 points per game after Gus Poyet was appointed head coach in October. They also reached the League Cup final and FA Cup quarter-final. Before his appointment, they averaged 0.125 points. 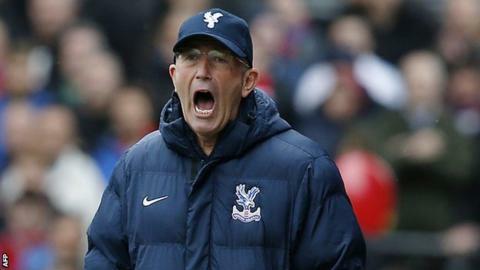 Crystal Palace averaged 1.46 points per game after Tony Pulis was appointed manager at the end of November 2013. Palace averaged 0.33 points before his arrival. The 10-year study by researchers at Sheffield Hallam University is believed to be the first of its kind. Football finance expert Rob Wilson, co-author of 'You Don't Know What You're Doing', said: "League position is clearly a massive concern for clubs changing managers during the season. "But our study found it can be less productive for clubs in the top half who may have less to play for than those fighting relegation." Of the 60 managerial changes examined, 46 were sackings, nine were resignations or departure by mutual consent, three were signed by other clubs and two were interim managers. There was a striking difference between the final league performances of clubs in the bottom half of the table - they leapt up more than a place after a sacking or resignation. In the top half, a team may drop almost two places on average. The research was concluded before the start of this season, which saw Cardiff, Norwich and Fulham all relegated despite bringing in new managers. But Wilson believes the survival of Sunderland and Crystal Palace adds weight to the study's findings. "It's not always the case, of course, but you could point to Sunderland and Palace as examples of when a change does improve a team's final league position," he added. "Chelsea learned to their cost that replacing Luiz Felipe Scolari and Jose Mourinho was costly and ill-informed, and didn't improve a final league standing." Researcher Dan Plumley said: "The findings of our study suggest that clubs who may be in a relegation dogfight may benefit from managerial change. "Given the financial rewards of the Premier League, club stakeholders may need to make bold decisions early enough to prevent relegation."